计国锋, 杨志强, 贾小林. MGEX和iGMAS的多系统轨道和钟差产品精度分析[J]. 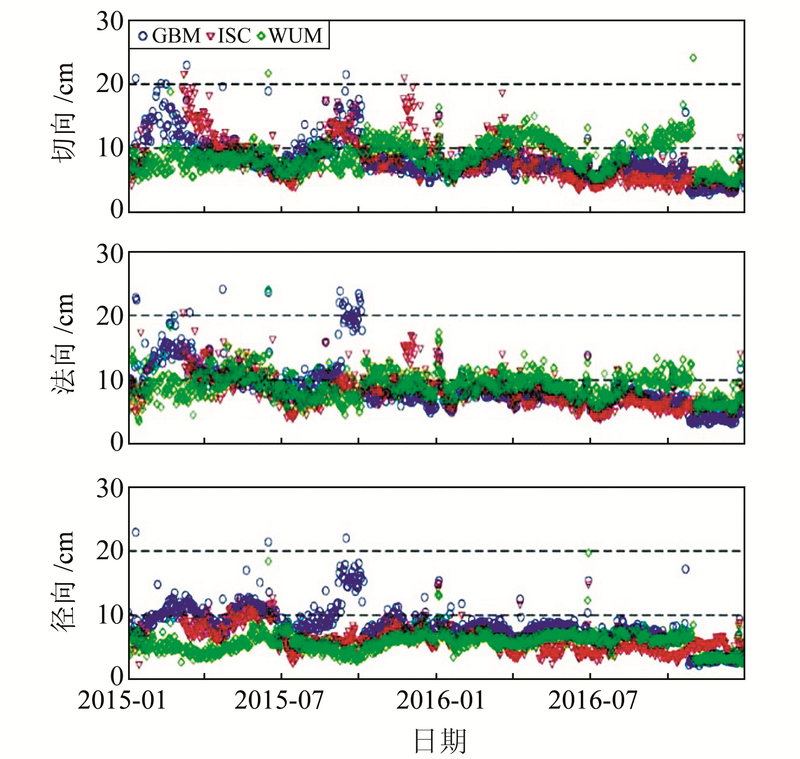 大地测量与地球动力学, 2019, 39(1): 13-19. JI Guofeng, YANG Zhiqiang, JIA Xiaolin. Precise Orbit and Clock Products for Multi-GNSS System from MGEX and iGMAS[J]. 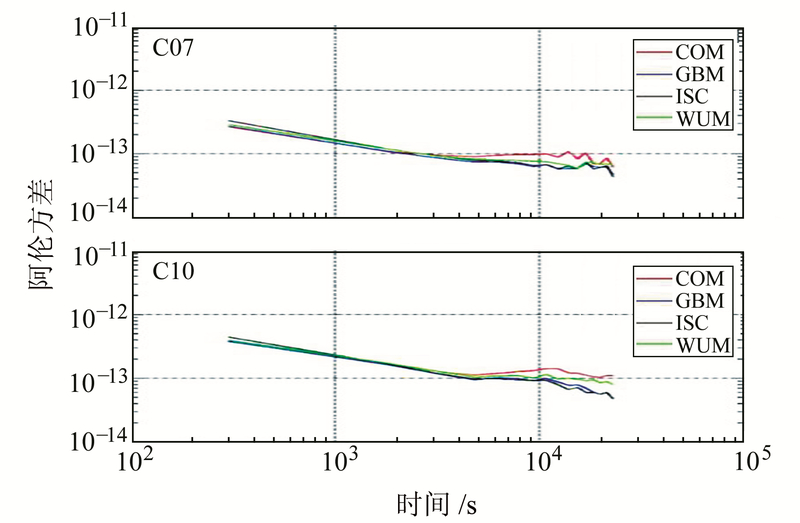 Journal of Geodesy and Geodynamics, 2019, 39(1): 13-19. Fundamental Research Funds for the Central Universities, No.310826175016. YANG Zhiqiang, professor, PhD supervisor, majors in GNSS data processing, E-mail:yang_gps@chd.edu.cn. 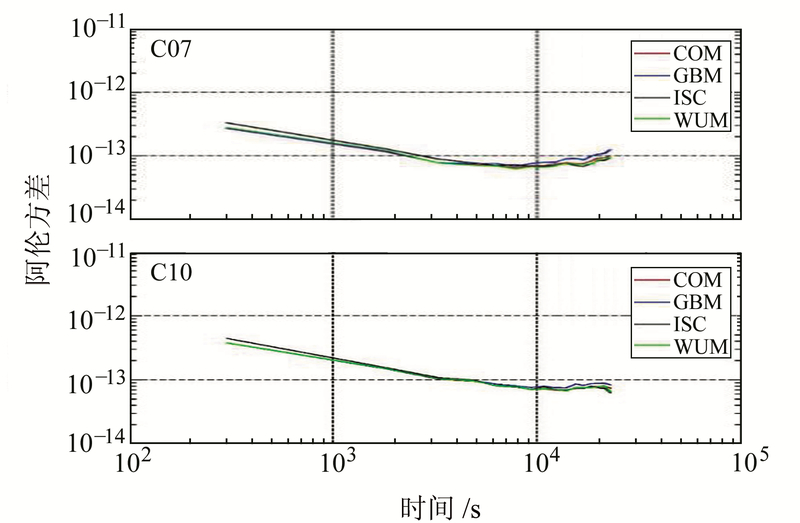 JI Guofeng, PhD candidate, majors in GNSS precise orbit determination, E-mail:changan_4440@163.com. Foundation support: Fundamental Research Funds for the Central Universities, No.310826175016. About the first author: JI Guofeng, PhD candidate, majors in GNSS precise orbit determination, E-mail:changan_4440@163.com. 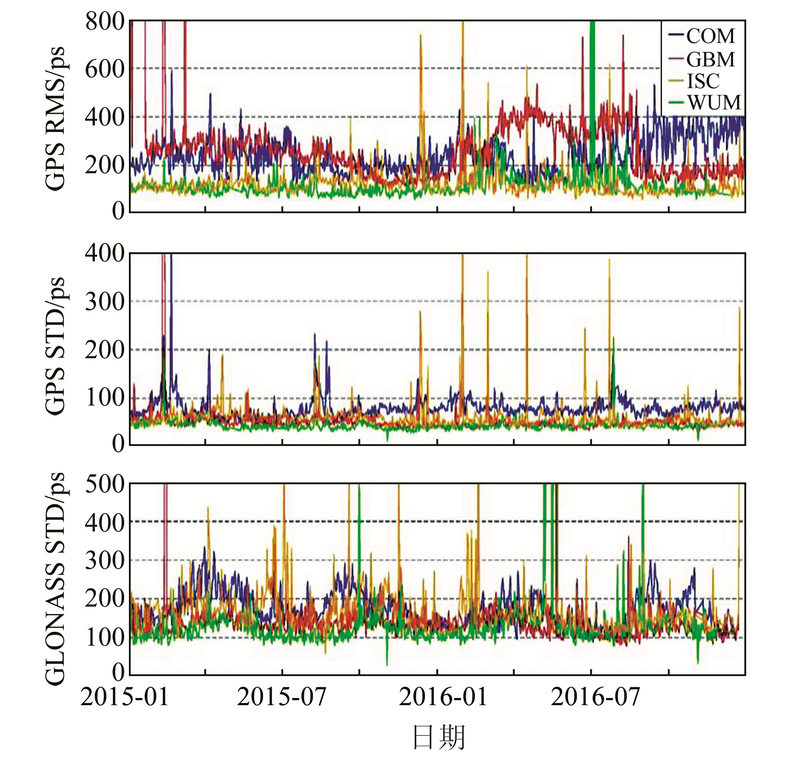 Corresponding author: YANG Zhiqiang, professor, PhD supervisor, majors in GNSS data processing, E-mail:yang_gps@chd.edu.cn. 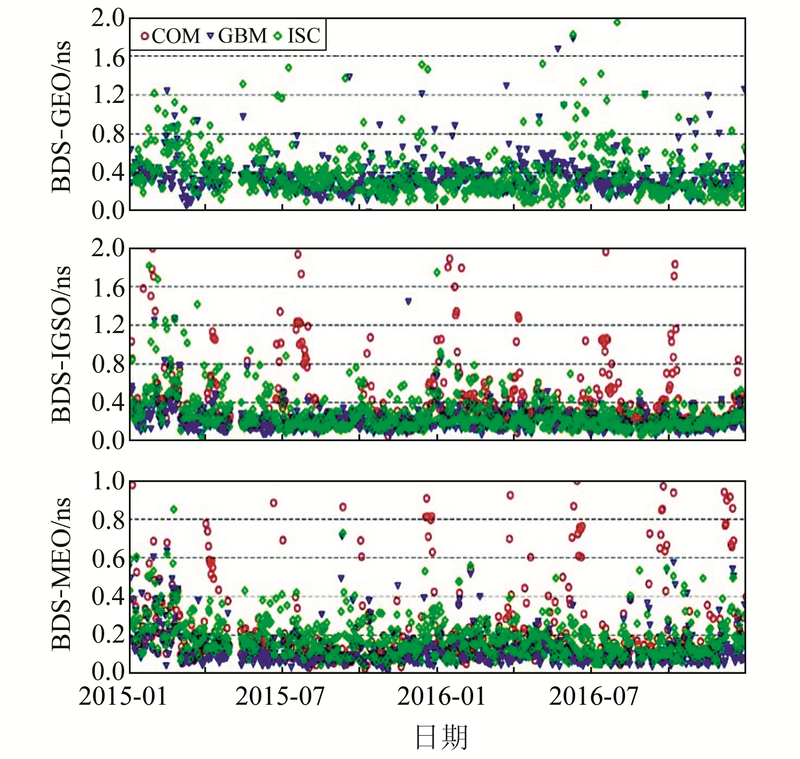 Abstract: Precise orbit and clock products for GPS, GLONASS, Galileo and Beidou from IGS MGEX and iGMAS are evaluated in this paper. 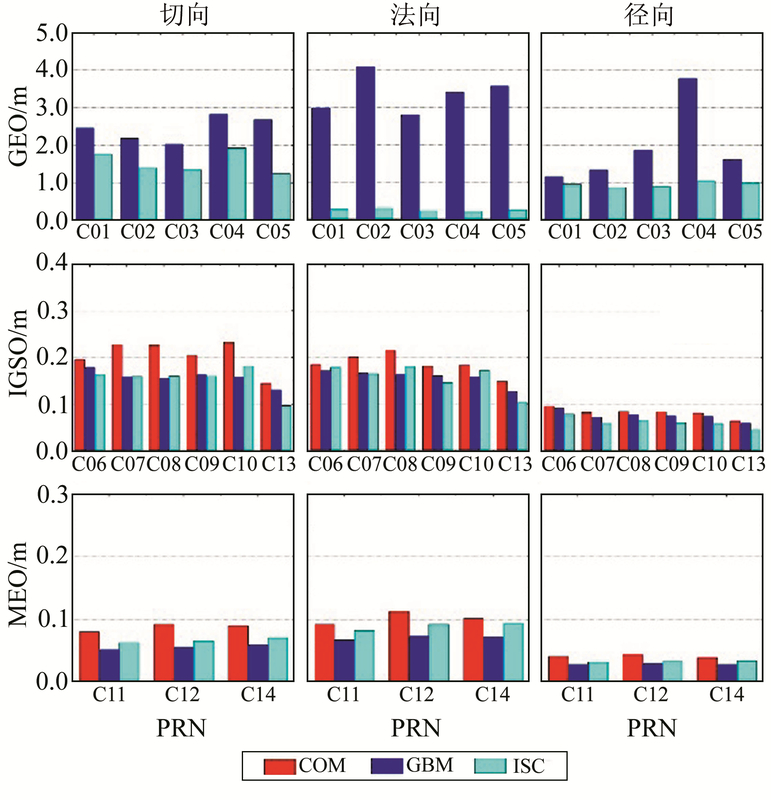 Comparison among individual analysis centers (ACs), SLR validations, clock polynomial fitting and Allan deviation are utilized to analyze the characteristics of precise orbit and clock products from each ACs. 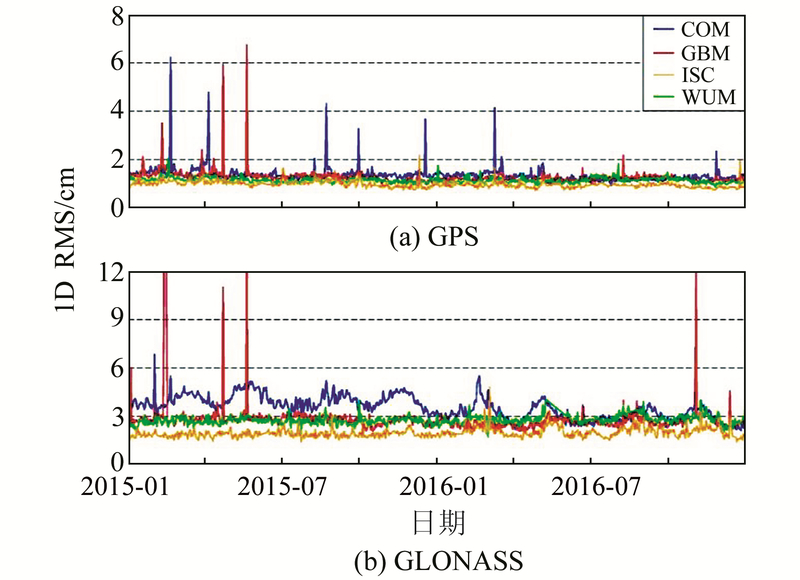 The results show that: the orbit accuracy of GPS and GLONASS is about 1.0~1.3 cm and 2.0~3.6 cm, respectively; the GPS and GLONASS orbit products from iGMAS are better than other ACs'. For the Galileo system, the orbit agreement is about 10~17 cm in general; use of ECOM2 or a prior model can improve orbit quality. For the BDS system, the orbit agreement is about 21~40 cm for IGSOs, 11~18 cm for MEOs, and the radial accuracy is better than 10 cm and 5 cm respectively. However, GEO orbits have the worst agreements, having a few meters differences and radial errors of about 25 cm. Clock agreement is 0.2~0.4 ns for Galileo, 0.35~0.46 ns for BDS GEOs, 0.25~0.33 ns for BDS IGSOs, and 0.11~0.21 ns for BDS MEOs. The BDS IGSOs and MEOs' clock products from CODE are markedly influenced by the yaw-attitude mode.